Posted on June 12, 2017 by Jonathan R. Grant, M.D., F.A.C.S. According to the American Academy of Dermatology, an estimated one in five Americans will develop skin cancer at some point. The good news is that skin cancer is easily treated when caught early. 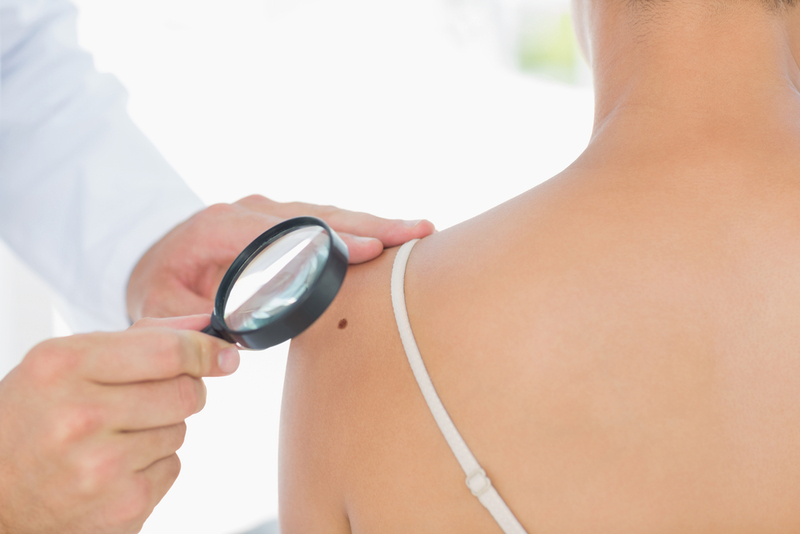 Because of his experience and expertise in skin cancer reconstruction, Dr. Jonathan Grant encourages all of his patients to be diligent about regularly checking their skin for suspicious moles and lesions. A useful tool to help identify early signs of possible skin cancer is to follow the “ABCDE rule” during monthly skin checks. Asymmetry – Asymmetry is the first sign of a potentially cancerous growth. Imagine drawing a line through the middle of the growth; if the two halves are asymmetrical, you should have the growth checked by a doctor. Borders – Check the borders of any growths. Borders that are jagged, uneven or poorly defined are worrisome and should be examined. Colors – Cancerous growths may be multi-colored with different shades of brown, black, tan, red, white or blue. Diameter – Measure the diameter of any growths. A larger diameter (i.e., larger than 6 mm, or the size of a pencil eraser) may indicate possible cancer. Evolving – Moles or lesions that change over time — either in diameter, color, elevation or shape — could be cancerous. If you suspect a growth is evolving, take photos of it to chart its progress. If you identify a spot or lesion on your face that matches any of these descriptions, or is itching or bleeding, your dermatologist or Dr. Grant may want to biopsy or excise the lesion and send it to a laboratory to test the tissue. If the tissue is, indeed, cancerous, Dr. Grant usually recommends a procedure known as Mohs’ surgery, which is a conservative way to remove cancerous cells and leave as many healthy cells intact as possible. During Mohs’ surgery, thin layers of cells are removed one at a time, and tested for the presence of cancer. If cancer is found, another layer is removed, and this continues until cancer is no longer detected. After removing all of the cancerous cells, Dr. Grant may use one of several reconstructive techniques to minimize scarring and restore a normal appearance to the area. He may place a skin or cartilage graft, or rearrange the soft tissues near the affected area. If Mohs is not the most suitable treatment solution, Dr. Grant will recommend an alternative. To learn more about skin cancer reconstruction and what it entails, please call (360) 336-1947 or email our practice and request a consultation with Dr. Grant.